The prime idea of sacrifice in its many variations is proved to be the gain of some benefit by the surrender of something of value, and the surrender was their own lives. 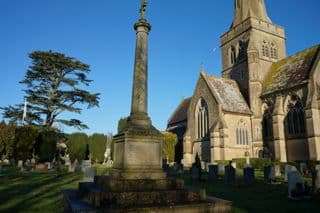 This is what 15 sons of Sutton Veny did during the Great War, and on Sunday afternoon a beautiful Memorial was dedicated and unveiled in the village churchyard to perpetuate the memory of these worthy and gallant men whose sacrifice was the supreme one. The memorial takes the form of a large monument built on a base of four steps on which rest a square with four panels and a high circular column, which is finished off with a cross. The whole of the monument is composed of the best Portland stone, and it reflects much credit on Mr Strong, of Portway, Warminster, who designed and erected it. The memorial stands close to the road and the panel opposite the road is inscribed to “The Glory of God and in honour of the men of this village who fell in the Great War 1914 – 1919” and on the other three panels are the names of the 15 men who died that their homeland may be liberated from the oppression of an envious foe. The memorial cost £170 and of this sum the money is a portion of a fund which was raised by house-to-house collections in the village. The full article from the newspaper including the sermon given on the day by the Rev Cannon Jacob who was the Rural Dean is here.